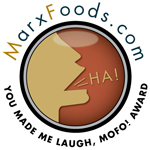 Posted by Peeps in Cook's Country, Cooking, Food, Home. While we hate to see Summer go, Fall is the start of the comfort food season. Food that cooks most of the day and makes the house smell wonderful. A dish that we do a couple times every Fall/Winter without fail is from our good friends at Cook’s Country and is their old fashioned roast pork. 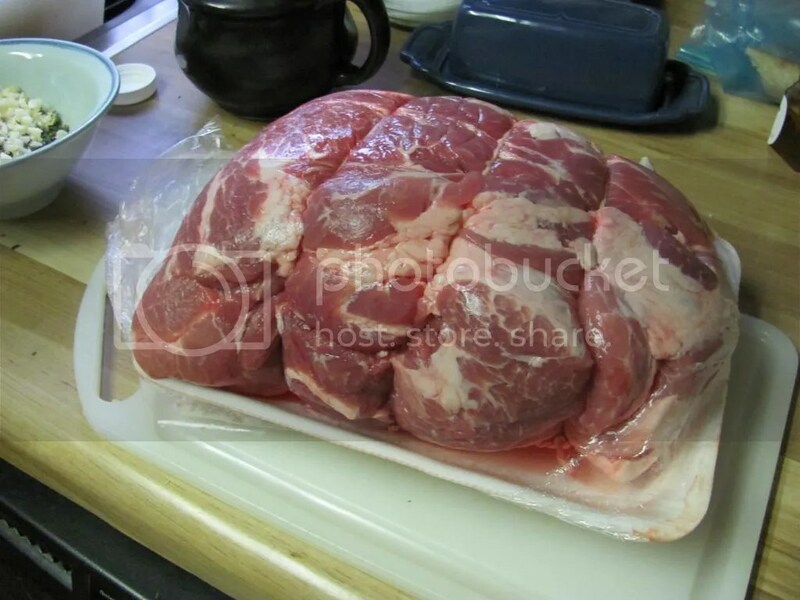 The recipe calls for a pork shoulder, but does not say what size. Just that it needs to be boneless. It’s not very hard to remove the bone, but the man at the supermarket does a much better job than I do. He even tied it for us. But try to pick up a good sized shoulder, you’ll be happy you did. 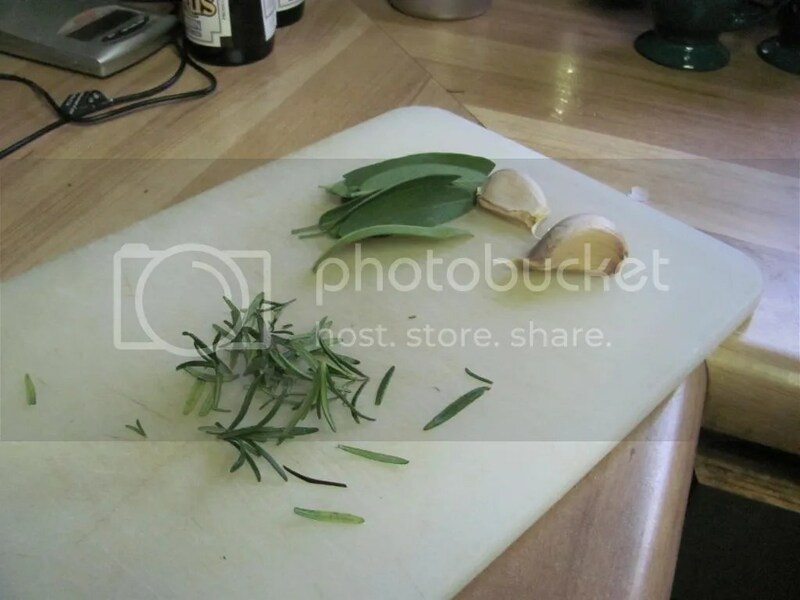 Combine three minced cloves of garlic, two teaspoons of black pepper, a teaspoon and a half of salt and one tablespoon each of fresh rosemary, fresh sage and fennel seeds, all chopped. 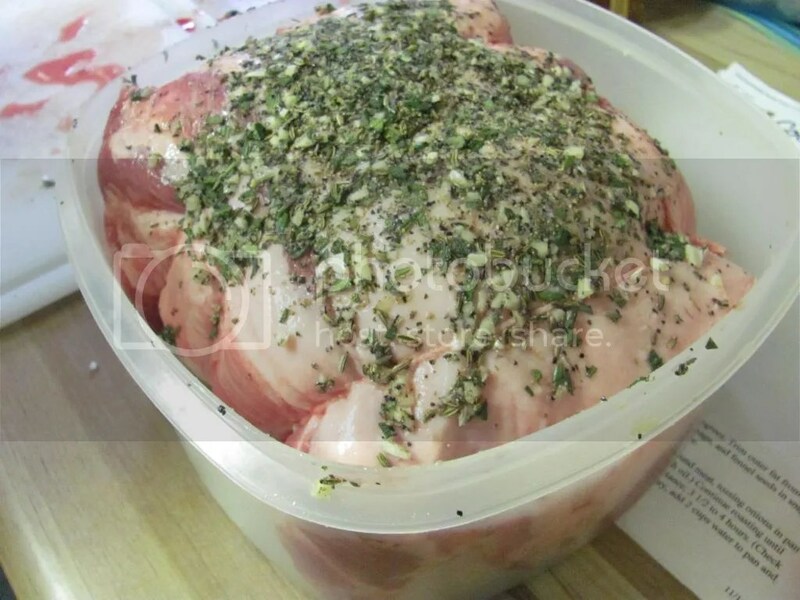 This mixture gets rubbed all over the pork. Now, when we do this, we let the rubbed pork sit in the fridge overnight. After all, how can letting flavor build be a bad thing? The next day, preheat the oven to 300 degrees. 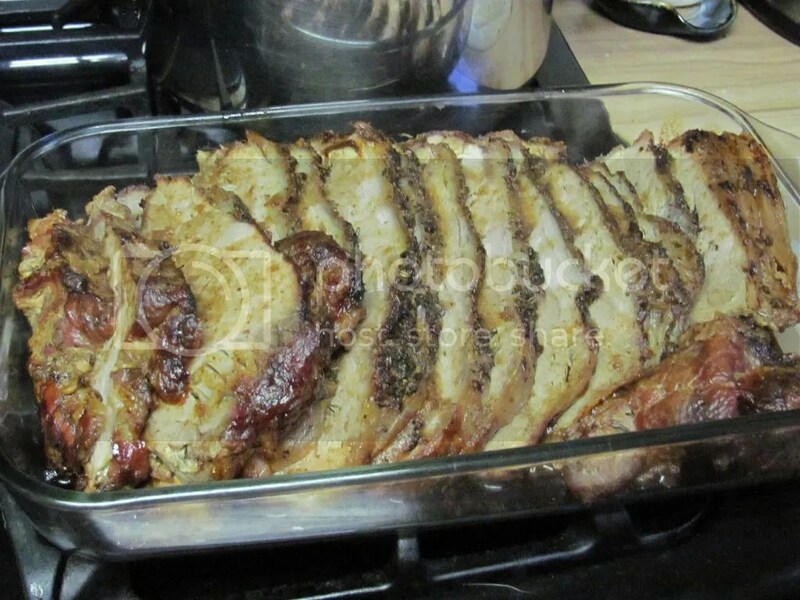 Place your seasoned pork shoulder in a large roasting pan and place in the oven. And walk away for three hours. Yup. Three. Do some of the stuff you’ve been meaning to do around the house. After a while, it’ll start smelling really good. After three hours add two red onions cut into one inch wedges to the roasting pan and add a couple cups of water. Then walk away for another three and a half to four hours. Yes, I said four. Finish that housework. Walk the dog. Seriously. But make sure to check about every hour that the water hasn’t evaporated, and add more if needed. You can tell your roast is done if a knife passes smoothly and easily through the center of the roast. Place the roast into a pan large enough to hold it and cover it and put it into the fridge until the next day. Pour the pan drippings into a measuring cup and add enough water so that you have a cup and a half of liquid. And save the onions in a separate bowl. Okay, you have to wait another day for this? After the smell has been making you crazy all day? The thing is, if you try to slice the roast when it comes right out of the oven, you’re going to end up with shredded pork. Really wonderful shredded pork, to be sure. But not nice big slices. That can only happen once it’s completely cooled. 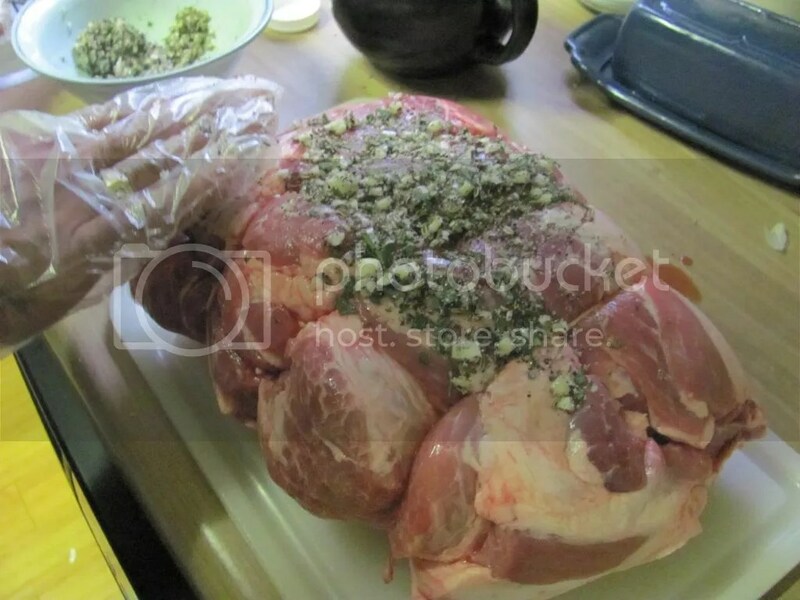 So, the next day rolls around and you really want to eat this pork. Slice the completely cooled roast and place into a large baking pan. The get the oven going at 300 degrees. While that’s heating, skim the fat off the reserved pan drippings and place the drippings into a sauce pan. Add a cup of apple cider, a quarter cup of apple jelly, the reserved onions and two tablespoons of cider vinegar to the sauce pan and bring to a boil then reduce to a simmer. 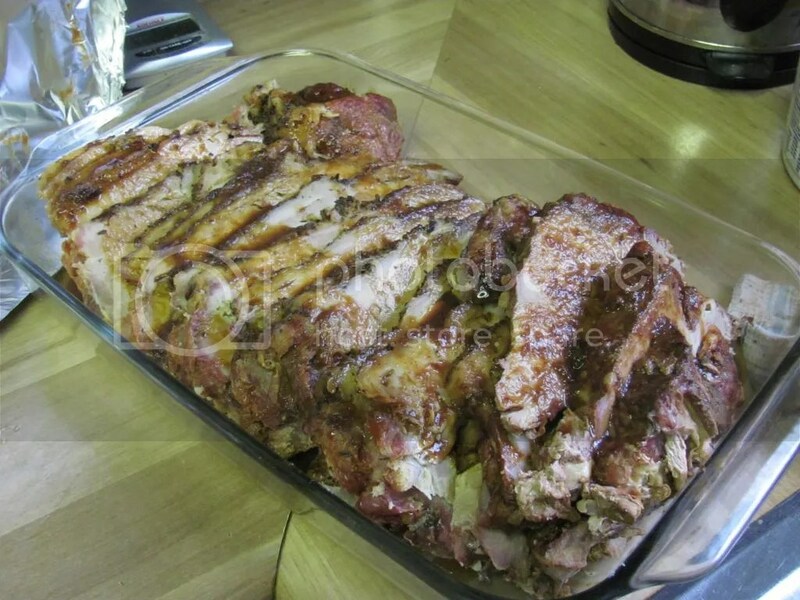 Spoon about half a cup of the sauce onto the meat, cover the pan tightly with foil and bake 30 to 40 minutes. Keep reducing the sauce until it coats the back of a spoon. Serve the sauce with the slices of roast. Now, do we really take three days to make one dinner? Without question, yes. This one. You can serve this with lots of mashed potatoes, or we really love serving this along side our vegetable mash. You will have ample amounts of leftovers that make wonderful sandwiches. Or another full dinner. We do this at least twice a year. And it’s always worth every minute of the wait. Okay that sounds amazing! Drooling here. It’s even better, really. Try it over the weekend. I always enjoy this one. For days and days.